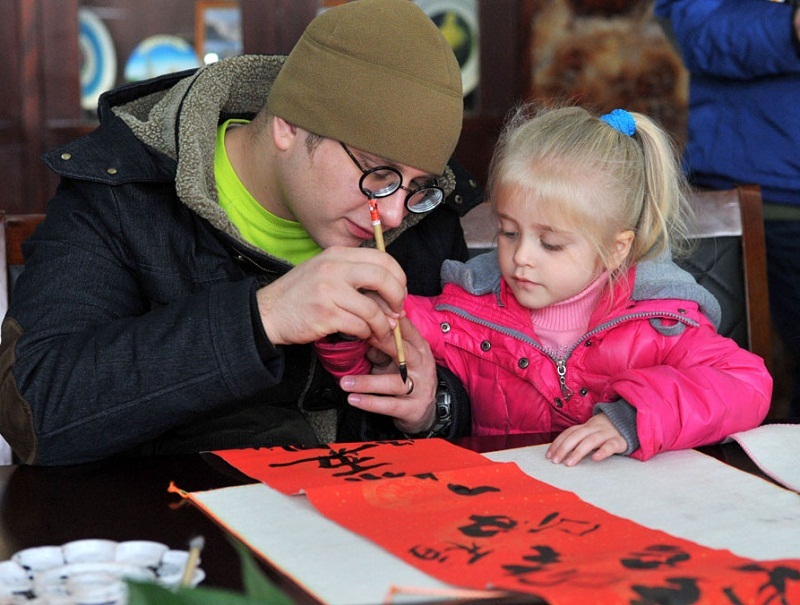 An international student （留学生）and his daughter was studying to write （写）a couplet in Nanjing, Jiangsu province, Jan 20, 2014. A couplet, or a pair of lines of poetry （诗）written on red paper, is an important decoration （装饰） during Spring Festival, or Chinese Lunar New Year, as it is pasted （张贴）on all the door panels. Dozens of international students from Nanjing Agriculture University experienced the preparation (筹备)for the coming Spring Festival, which will fall on Jan 31 this year. A girl showed a paper-cutting artwork(剪纸作品).Paper-cutting，or Jianzhi, a traditional folk art（民间艺术）, has been widely applied in China for festival decorations.International students posed for photos(合影留念 )with their couplets writing works.